Château de la Roche-Guyon, France (part of an album)1; (Paul Prouté S.A., Paris); purchased by NGA, 2003. 1 The album was bound in vellum, with "Abraham" on the cover and "Ligeoys" on the back cover. 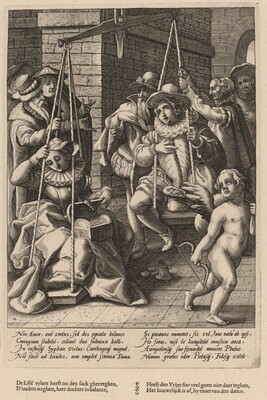 The Château de la Roche-Guyon stamp was on some of the pages, which included a variety of northern mannerist prints by Goltzius, Matham, Saenredam, and others. It was apparently dismantled by Prouté for sale of some of the prints to the NGA. The New Hollstein Dutch & Flemish Etchings, Engravings and Woodcuts, 1450-1700. (Karel van Mander, Marjolein Leesberg, author). Rotterdam: Sound & Vision Interactive, 1996-, no. 96, state i/iii.